Kids, Cows and Grass: I saved his life! Every three to four hours, during the day and night in February and March, we are concentrating on calving season. We check our cattle frequently, although they rarely need our help delivering the calf, we do need to weigh each calf and put an ear tag in to identify him. On a registered Angus ranch, this must be done within a few hours of birth. So we routinely check for new calves. Today was a chilly overcast day on our Kansas ranch, and I spent the morning outside treating a sick yearling heifer, helping our hired man feed the cows and keeping an eye on heifers that are due to calve any day. This afternoon, I spent time at the computer updating calving records while sipping hot tea and wearing "comfortable clothes!" At about 3:00 in the afternoon, I decided not to put on my coveralls and work boots to check for calves. Calving season has been going well and we have had no trouble lately. So I slipped on tennis shoes and a sweatshirt and headed out to check for calves. The hired man had left a few hours ago, but he told me that there was a cow in labor on the far side of the field, near the trees that bordered the creek. She seemed to be doing fine, so I planned to be able to check whether she had a bull or heifer, but I was unable to find her. I found four other cows that had calves and they were doing well. Two heifers calved earlier in the morning and I checked them to make sure they were up and nursing. All was looking great, but I still hadn't found the cow I was looking for! I began to wonder if he had told me the wrong ear tag number, or maybe she wasn't really in labor, but I still drove my truck along the fence bordering the creek one more time....and something caught my eye! There she was....across the fence, on the far side of the creek, looking and calling to something down in the creek bottom! I thought "NO...you didn't have him on the ice!" But yes, she did. Actually it looked like she had jumped the fence, found a nice spot to labor on the far side of the creek with a bed of dry leaves and settled down to deliver her calf. But once he was born, and she began licking and nuzzling him, he tried to stand and somehow stumbled onto the ice of the creek. While the ice was strong enough to hold an 87 pound bull calf, it was not strong enough to hold his mother! You can tell from the picture that she had tried to get to him, but the ice was breaking below her and she stopped when the water was belly-deep. When I found them, the cow was still calling to him, and the calf was still struggling to stand on the slick ice and walk to his mama. But I knew that soon the ice would drop his body temperature to a level that he could not live and I had to get to him before the mama cow tried to walk on the ice again. Remember, I was alone and not dressed for this kind of mess! But if I left, and she walked out on the ice again, it would surely break and he would be plunged into the freezing water deeper than he could stand--even if he could stand. So I stayed and did the best I could: first, I took a picture with my phone (Ha! ), then I took off my coat, put my phone in it, emptied my pockets and began to remove my shoes. In the meantime the cow on the opposite bank began to head out to her calf again. I didn't want to, but I jumped out onto the ice, slipping in the slush in my sock-feet, grabbed the calf by the leg and pulled him to me. The cow kept coming, breaking the ice as she walked. The ice below me cracked and popped, and I stood up and picked up the calf and somehow threw him onto the bank that was as high as my head! He immediately tried to stand and wobble to his mama again and she turned back to the other side of the creek. 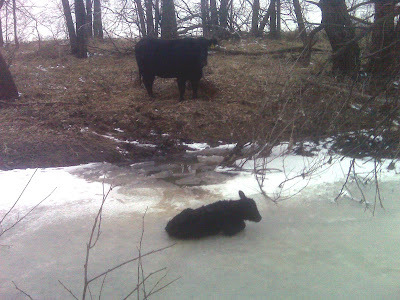 I breathed a sigh of relief when I realized the ice held and I was not submurged, the calf was alive and still warm, and the cow still wanted him! Now the trick was to get the cow across the creek to her calf. That took another 30 minutes, as the creek bank was too high for her to climb where we were. I cut the fence to get her back into the field, gave the calf some reconstituted warm colostrum, and sent them off toward the straw bedding we had rolled out a day before! I was cold, my feet and knees were soaked, my shoulder and hip hurt--I don't know when or how I hurt them, but it must have happened as I boosted the 87 pound mass of the calf up over my head--but the calf and cow were safe and happy. He is looking great now, and no worse for his experience. You know, things like this happen every day on a cattle ranch--but today it feels good to know I saved his life! Debbie, what a great story and picture. That's a very lucky calf and cow, thank goodness you were there. Your love for your cattle is pretty obvious from your other posts but this one really drives it home. Great retelling of your fantastic care of your animals! I hope you are warmed up now! You deserve to feel terrific! My kids loved this story...I think you could make it into a children's book! We love the pictures, too. this is so very inspiring, I know the joy of when things go right, and the sorrow when things do not work out. Thanks for being a fellow hard working beef producer and sharing your story. Your blog is probably my very most favorite on cattle ever. We also raise registered Angus but in California. Everything is so different from place to place. We both have to work full time to have our cows, so we have to try to breed to only bulls that are high calving ease because we both leave home before light. So we have to have animals that can do it alone. It is hard not to be here to watch, and I worry a lot about them. Thank God, we are blessed with good calving ease. I love my cows too, but I don't know that I can say it as good as you do. Thanks for being a great example of an excellent cattle breeder and environmentalist. Kay, Thank you so much for your kind words! I'm thrilled to meet you! You don't have to say it well to be a good advocate/blogger for ag. Just so long as you are willing to tell it like it is! What a great story! It is always wonderful when we are there to save the life of a newborn calf. We raise Angus, Angus-Cross cattle in Northeast, Kansas and had a similar story this calving season. We are new to your blog and have enjoyed your stories and can relate to several of your posts. My husband's experience with saving a life this calving season. This is my favortie cattle blog, by someone who is actual out there and is a show mom. A couple years ago we had one that claved in a dry creek, that hadnt been flowing for several years. Later that night we had a storm come in and needless to say he didn`t make it. Thanks! I appreciate your kind comments. We had a heifer take her calf into this same creek bottom this year...but it is totally dry. So she saved her little baby from the cold winds. I'm sorry to hear your calf didn't make it. Cows really try to do what is best for their babies, but they can't predict Mother Nature, either.